We handcraft our all natural Manuka honey skincare products on our Kansas farm. Fennel is one of those aromatic herbs cultivated for both its culinary and medicinal uses. I must admit, I love cooking with fennel! If I see a recipe that includes fennel, I’m all over it. And since I was cooking with so much fennel, it made good sense to grow fennel and so I did. Fennel is a member of the apiceae family which includes carrots, parsnips, celery and dill. 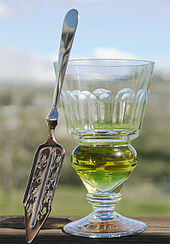 This aromatic flowering plant along with it’s cousins, anise and licorice is one of the primary ingredients used in the production of absinthe. According to Greek mythology, Prometheus used a fennel stalk to steal fire from the gods. 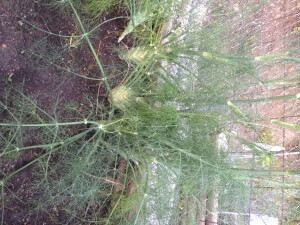 Which is kind of ironic, since fennel is a member of the plant family with hollow tubular stalks. Ouch! Bet that had to hurt. The fennel bulb as well as the fronds are primarily used for cooking. The bulb can be roasted, sauteed or stewed and will add a distinctive licorice flavor to your culinary efforts. Its important to note the stalks can be tough and should be removed. Use only the more tender white bulb and avoid overcooking the fronds as they easily burn. 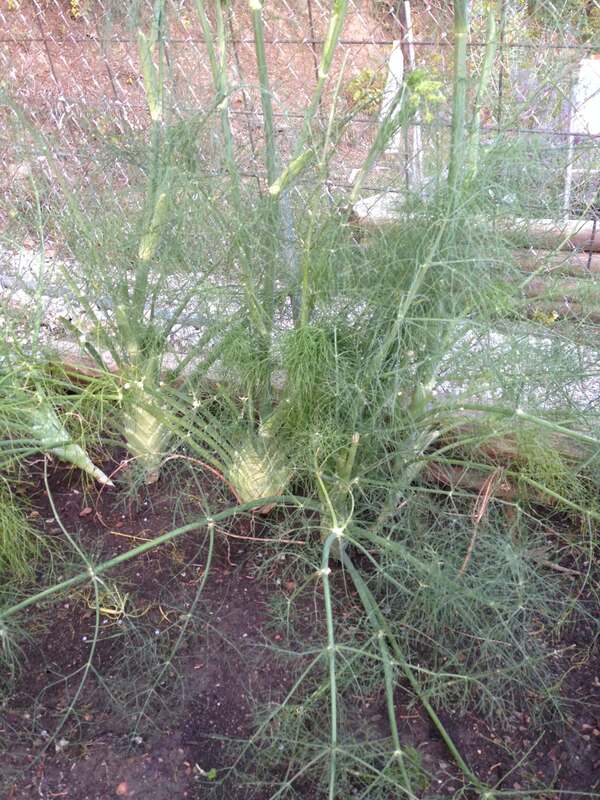 Medicinally, fennel has many purported beneficial effects. The Romans considered fennel as the, “herb of sight.” It is supposed to alleviate hypertension as well, by acting as a diuretic and increase milk production in nursing mothers. 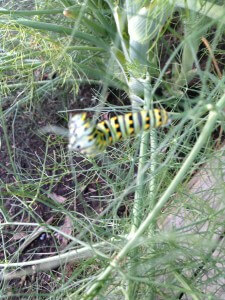 Fennel is the plant food for larvae of the mouse moth and the anise swallowtail butterfly. That is where the funny thing happened on the way to the fennel patch comes in. I’m the bee queen right? I’m supposed to love all flying pollinators. And I do, really I do! 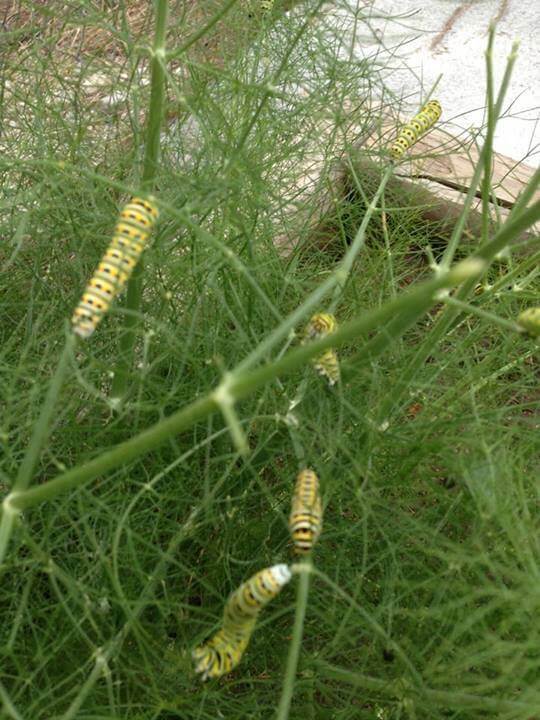 Except when they are feasting on my fennel plants. Oh no….. My stomach, none to settled after watching the chickens gobble down the wiggly little, “wascals,” did a double take. Every conscientious beekeeper is aware of the plight of the Monarch as well as the decline of the honeybee. 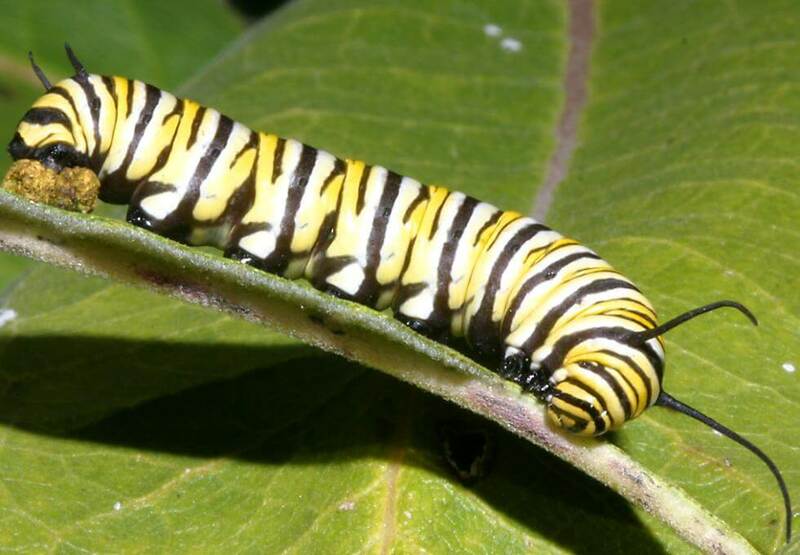 The Monarch population is at an all time low, significantly affecting their migratory pattern. I felt sick and suddenly, my fennel didn’t look quite so appealing after all. But wait, there is a happy ending to this story. 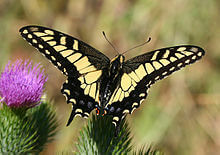 (Well, maybe not for the anise butterfly.) Another friend on Facebook came to the rescue. Indeed, the caterpillar on my fennel looked similar to the Monarch but was not. See, dots versus stripes. And the Monarch feeds primarily on the milkweed plant which looks nothing like the fennel. 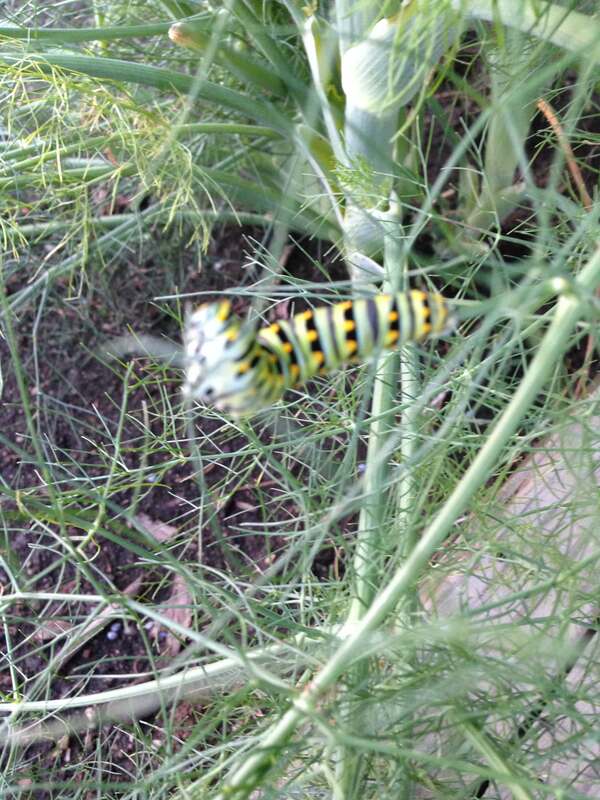 So, despite my sacrificing the anise butterfly caterpillars, which by the way, are not endangered, I continue to enjoy my fennel in many favorite recipes. But, I will admit to turning a blind eye to the lone green and black spotted fellow I saw tonight clinging tenaciously to a fennel frond. Besides, I had just fed the chickens.